Here at PLAN we really love nature and we love what we do: protect land and nature (PLAN). This Valentines Day we are challenging YOU to take a moment, go out on a PLAN trail or preserve, take a picture of a PLAN trail marker and share it on Instagram or Facebook with a little note on why you LOVE LAND. Get artsy, get funny, get inspired and share why you love the land in Saratoga County as much as we do. Use #PLANlovesland and tag @SaratogaPLAN to enter the photo contest. At the end of February we will pick one lucky winner based on your submission. See rules below. 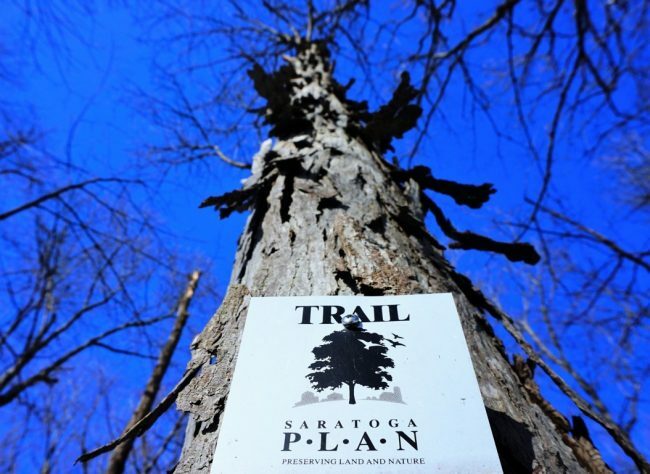 Take a photo of a Saratoga PLAN marker while out on your favorite PLAN property. Get artsy, get funny, get inspired and tell us why you love the land in Saratoga County as much as we do. How to Enter: Participants enter by tagging your photo #PLANlovesland on Instagram or Facebook specifying where the photo was taken. The Photo Contest runs from 2/8/2019 9:00 a.m. EDT through 2/28/2019 5 p.m. EDT. Winner will be chosen at random by Saratoga PLAN. Employees and Board Members of Saratoga PLAN, Inc. are ineligible to participate. Your odds of winning depend upon the total number of entries received by PLAN. Winner will be notified via direct message on the platform of submission after 5 p.m. EDT no later than 3/5/2019 and must confirm if items should be shipped with shipping address before prize is shipped or make arrangements to pick up the items at PLAN’s office. If shipping address or pick up arrangements are not confirmed, winner is assumed after one month to have forfeited prize. Prizes are not transferable or redeemable for cash or other consideration. You may only submit one photo to be considered in the contest. By submitting a photo for this contest, you thereby give Saratoga PLAN permission to use your photo throughout its social and electronic media as well as in print. Saratoga PLAN reserves the right to disqualify any person tampering with the operation or conduct of this contest, including, without limitation, the entry process or the operation of the web site or otherwise violating these rules. Saratoga PLAN is not responsible for any problems with your entry, including technical failures related to computer, telephone, cable, and unavailable network or server connections, or other failures related to hardware, software or virus, or incomplete, late or misdirected entries. By entering the promotion, you agree to these terms and conditions. Prizes: One (1) Saratoga PLAN T-shirt, and One (1) Saratoga PLAN tote bag. Photo taken spring 2018 at the Boston Creek Preserve. We call the tree the three sisters. Great preserve has a wonderful Heron Rookery and also an osprey nest there.